Thousands of Venezuelans took the streets on Wednesday – the anniversary of the establishment of democracy in the country in 1958 – to call for an end to the socialist regime of Nicolás Maduro and the restoration of the democratic order. Photos and videos of streets flooded with protesters throughout the country, from the capital Caracas to far-west Táchira province, began to surface on social media early Wednesday afternoon as attendees began to congregate. At press time, the protests remain ongoing, so no statistics on the number of protesters in each city are available. Juan Guaidó, the president of the Venezuelan National Assembly, organized the protests. The National Assembly, which Maduro does not recognize, is the only remaining democratically elected institution in the country. Maduro attempted to illegally erase the legislature with the creation of a “national constituent assembly” to write laws, made up exclusively of members of Maduro’s United Socialist Party of Venezuela (PSUV) and Maduro family members, including his wife and son. Guaidó called the protests to officially declare Maduro an “usurper” and, appearing at the Caracas protest, took an oath of office as the official interim president of Venezuela. Guaidó is a member of the Popular Will party, the party of political prisoner Leopoldo López. Popular Will is a member party of the Socialist International; PSUV is not, and the Socialist International has campaigned against Maduro’s regime. 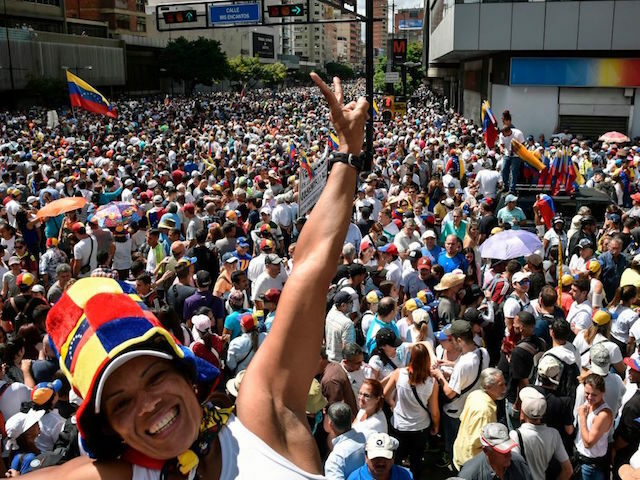 Guaidó posted images on his official Twitter account of other major population hubs in the country, including Aragua, Bolívar, and Nueva Esparta states, which showed similarly large crowds demanding an end to Maduro’s regime. El Nacional, the nation’s oldest continuously publishing newspaper, also posted photos from Táchira, the westernmost state on the border with Colombia. Táchira has long been a major hub of anti-socialist sentiment. A video also began circulating online from Zulia state showing the city of Maracaibo flooded with protesters. The video received the widest distribution through the Instagram account of Venezuelan musician Nacho, who has vocally called for an end to socialism in his country. Maracaibo, Edo. Zulia, Venezuela. 23 de Enero 2019. Guaidó, in Caracas, not only delivered a speech but took an oath of office making him the legitimate president of Venezuela, a move the National Assembly is constitutionally mandated to make in the event of a democratic collapse. In Caracas he was joined by another major figure in the Venezuelan resistance, López’s wife Lilian Tintori, who expressed her support for the National Assembly. “We want an end to this dictatorship, we want the usurper to leave. It’s been enough years of suffering and struggle,” Tintori, thrust into the front lines of the protest movement by her husband’s arrest, said. In a display of unity, María Corina Machado, the head of the right-wing Vente Venezuela movement, also attended the protests and backed Guaidó. During the era of the Democratic Unity Roundtable (MUD) (2014-2017), a failed coalition of socialist parties against Maduro, Machado was among the most prominent conservative voices insisting that a transition out of the Maduro regime must not lead to power ending up in the hands of other socialists. Her support could temper concerns that trusting parties to the MUD dialogue may stymie any progress towards removing Maduro. The government of the United States recognized Guaidó as the legitimate president of Venezuela shortly after he completed his oath of office. The government of Brazil had already done so last week. At press time, perhaps due to significant international media attention, protesters have not reported incidents of mass violence by Venezuelan military troops. In Zulia, however, a local newspaper reported that National Guard troops attempted to dispel a crowd by firing into it, the first sign of violence at one of the national events. Many protesters fear that more violence will occur after the sun begins to set and troops can use the cover of night to target, assault, and kill protesters, as they did during the protests of 2014 and 2016. Venezuelans overthrew their military dictatorship on January 23, 1958, replacing it with three major political parties. The parties signed an agreement known as the Puntofijo Pact shortly thereafter in which they declared they would hold free and fair elections, accept the results of those elections, and refrain from violence. The pact kept Venezuela’s democracy intact until the rise of Hugo Chávez, a socialist dictator who had failed to enact a coup in the early 1990s, in 1999.